Lexus of Richmond presents Isabelle Bauer of Cosby High School as our 26th nominee for the Leadership Award Scholarship. Having a 4.45 GPA, she is a member of the National Honor Society and the National French Honor Society. Isabelle is a member of the National Art Honor Society and is the President for her senior year. She is additionally a three year member of the Beta Club. Isabelle was selected as the Freshman Visual Arts Student of the Year and the Sophomore Visual Arts Student of the Year. In 2018 she was named the Junior Photography Student of the Year. In 2017 Isabelle was selected as the Scholastic Art and Writing, Silver Key Award Recipient. While in her sophomore year, Isabelle became a published illustrator. Mark Ricketts, the author, contacted Isabelle to have contribute to his book “Socco and Slurpie in PE Class”. She completed her illustrations over a five month time period. This book has since been sold online and locally to the author. In 2017 and 2018 Isabelle was an Assistant Coach for the Westerleigh Warriors Swim Team, and she is currently the Head Coach for the 2019 season. Since 2016 Isabelle has been a member of the Cosby Varsity Swim Team. She holds 5 school records, those being: 100 Free, 100 Back, 200 Medley Relay, 200 Free Relay, and 400 Free Relay. For her 2019 senior season, she was a Regional Finalist in the 50 Free (2nd), 100 Back (2nd), 200 Medley Relay (2nd), and 400 Free Relay (1st). After qualifying for five events at States, Isabelle placed on the 100 Free (14th), 200 Medley Relay (14th), and 400 Free Relay (14th). Isabelle was a 2018 State Finalist for the 200 Free Relay (14th) and the 400 Free Relay (14th). She was a 2018 Regional Finalist for the 50 Free (3rd), 100 Free (2nd), 200 Free Relay (3rd), and the 400 Free Relay (1st). Outside of Cosby, Isabelle has been on the Poseidon Swim Team since 2016. She was named their “Breakout Swimmer of the Year” in 2017 and the “Swimmer of the Year” in 2018. Isabelle will be continuing her swim career in the fall as a member of the swim team at the University of Maryland Baltimore County. Throughout her high school year, Isabelle has been active in serving her community. She has helped organize blanket and clothing drives during the winter from 2016 – 2019 to aide the Richmond Friends of the Homeless. In 2017 Isabelle fostered 3 kittens through the Henrico Humane Society. To assist with the Grange Hall Elementary School Fall Festival, Isabelle has given her time to face paint and create haunted house props. She has also helped Grange Hall with their Bingo Fundraising Night. Since 2016 Isabelle has helped the Poseidon Swim Team with tracking swim times and awarding ribbons at meets. She is currently creating a recruiting/marketing video for the Poseidon Hanover Swim Team. Isabelle has won a dinner for two and is now in the running for the $10,000 scholarship. 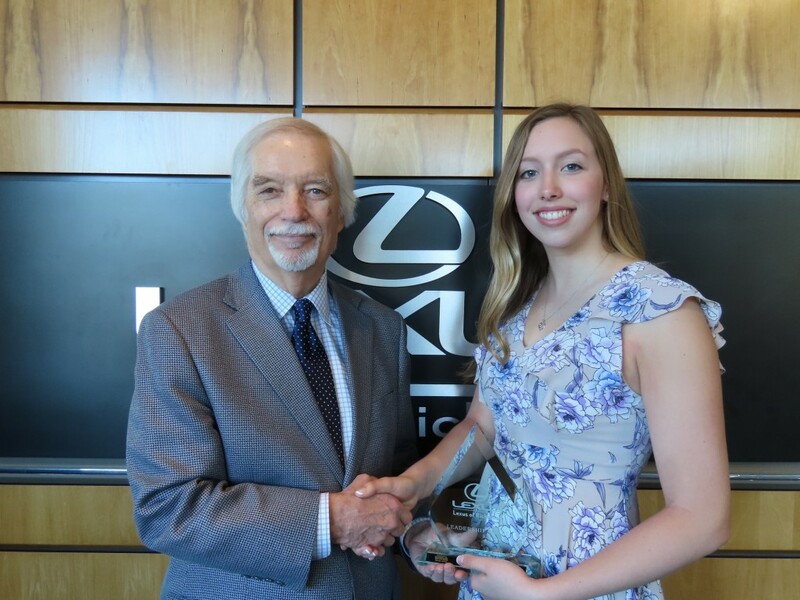 Watch the Fox Richmond – WRLH interview and the Lexus of Richmond Leadership Award interview to learn more about Isabelle! Remember to check Facebook for more information about each weekly nominee throughout the school year! Lexus of Richmond presents the 25th weekly nominee for the Leadership Award Scholarship, Alex Brown of St. Christopher’s School. Having a current 4.4 GPA, Alex has been on the High Honors List every semester. He is an AP Scholar with Distinction, and he scored a 1510 out of 1600 on the SAT exam. He was recognized for the Best 10th Grade World History Research Paper. Alex was awarded the Williams Book Award. Additionally Alex was St. Chris’ nominee for both the Belk Scholarship at Davidson College and the Morehead-Cain Scholarship at UNC-Chapel Hill. Voted into the Honor Council by his peers, Alex is serving as the Chairman for his senior year. The council investigates potential honor offenses, determine a fair verdict and recommends a punishment if necessary. As the Chairman Alex organizes programs and addresses the student body on the topic of honor. He is a peer advisor to a group of freshman at St. Chris. Alex is a member of the investment club as a sector leader in the group, and he is an artist focusing on drawing, painting, and photography. Over the summer of 2018, Alex held an internship with Shagbark Restaurant. He was able to shadow the pastry chef and help prep and plate the food being served. By the end of the internship Alex created his own dessert, and it sold at the restaurant for three nights. Following college, Alex wants to attend the Culinary Institute of America and pursue a Baking and Pastry Arts Degree. Alex is an active participant on the St. Chris golf team. He was on the JV Team as a freshman, followed by 3 years on the Varsity Team. Alex is a co-captain for his senior season. In 2017 the team won the State Championship. Later, the team was the 2018 Prep League Champion. Outside of golf, Alex played on the JV Soccer Team for two years. All throughout high school Alex has assisted with All Saints Preschool. He has helped clearing nature trails, rearranging classrooms, and setting up events. Alex has volunteered for the Anna Julia Cooper School. With the AJC he would help the students with their classwork and assist the teachers with various tasks. With the Saturday Academy at St. Chris, Alex will tutor local inner city children with their homework and then play sports or games with the children. Alex has won a dinner for two and is now in the running for the $10,000 scholarship. Watch the Fox Richmond – WRLH interview and the Lexus of Richmond Leadership Award interview to learn more about Alex! Remember to check Facebook for more information about each weekly nominee throughout the school year! 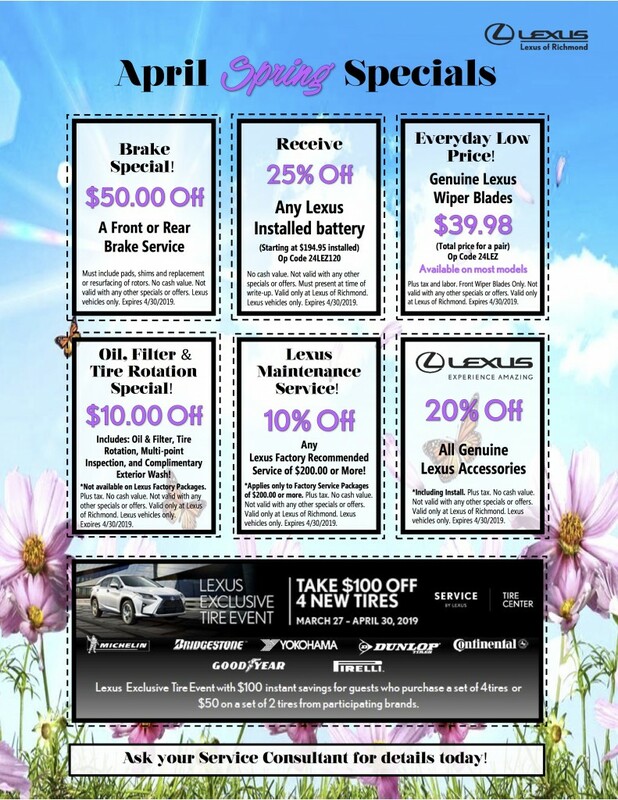 Lexus of Richmond’s April 2019 Service Specials! *These prices are valid through April 30, 2019. *Call 804.323.7695 to learn more or click here to read more about these deals! Lexus of Richmond’s 24th weekly nominee for the Leadership Award Scholarship is Will Pomeroy of Midlothian High School. Consistently on the Distinguished Honor Roll, Will has a current GPA of 4.77 which ranks him 4th in his graduating class. He scored a 1430 on the SAT out of a possible 1600, and he is an AP Scholar with Distinction. Will is a member of the National Honor Society, Science National Honor Society, Mu Alpha Theta, and the National Business Honor Society. In his time at Midlothian, Will has been recognized as a Student of the Month and a Male Student of the Year. He has also received the Core Value Award. Will is a Jefferson Scholar Nominee and a Jefferson Book Award Recipient. While attending Midlothian, Will has been involved with numerous activities and organizations. He is currently the President of the Future Business Leaders of America (FBLA) with nearly 200 members in the school. Will is also a member of the DECA Club which focuses on business, finance, marketing and entrepreneurship. He is involved in the Latin Club and the Young Life Club. Will is a part of the Sidekick Program where he assists with incoming freshman, and he is a member of the Stocks Club and Battle of the Brains. A three sport Varsity athlete, Will is a part of the Football, Basketball, and Lacrosse teams. He was selected as a captain for all three teams as a senior, and he serves on the leadership council representing the football team. Will is a starting wide receiver and defensive back on the football field. As a junior he was recognized for the Honorable Mention All Region Team, and as a senior he was named to the 2nd Team All Region. Having been on varsity basketball all four years of school, Will is a starting point guard for the team; he was an All Region Honorable Mention as a junior. Also a starter for lacrosse, Will is a four year varsity player as a midfielder and face-off man. He was selected for the 2nd Team All Metro as a sophomore and junior and the 2nd Team All State as a sophomore. Will was selected for the 1st Team All Region following his 10th and 11th grade seasons, as a freshman he received a 2nd Team All Region nod. He is also a two time recipient of the 1st Team All Conference selection. Throughout his high school career, Will has volunteered for the Medford Basketball League. Through this league he helps with basketball games during the school day which are played by special needs students. He has also assisted with the Midlothian Trojans Kids Basketball Camp every year. Along with his teammates Will has helped with the Trojan 40 Lacrosse Camp. As a part of the football team he also helps with table set up at Winfree Baptist Church. Will has won a dinner for two and is now in the running for the $10,000 scholarship. 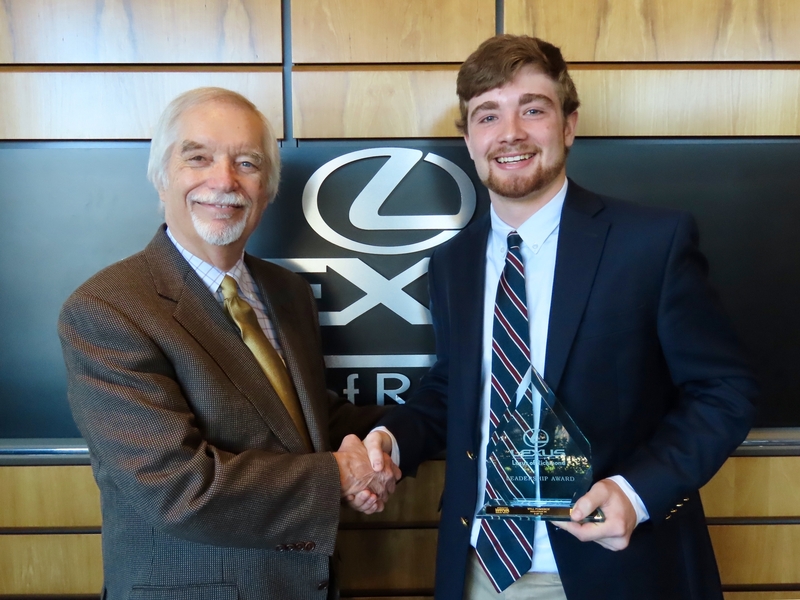 Watch the Fox Richmond – WRLH interview and the Lexus of Richmond Leadership Award interview to learn more about Will! Remember to check Facebook for more information about each weekly nominee throughout the school year! Lexus of Richmond presents Katlyn Hicks from Powhatan High School as our 23rd nominee for the Leadership Award Scholarship. Ranked 5th in her graduating class, Katlyn has a current 4.4 GPA. Katlyn is a member of the National Society of High School Scholars. She is a member of six honor societies, including: the National Honor Society, National Math HS, National Science HS, National Art HS, National English HS, and the National Spanish HS. Katlyn has received Virginia High School League academic Excellence Awards every year from 2015 – 2018. As a member of the Advanced College Academy, Katlyn will graduate high school with an associates degree from Reynolds Community College. She has received the National America Miss Virginia Academic Excellence Award. Katlyn is also recognized as a member of the Phi Theta Kappa International Honor Society for high schools and two year colleges. Outside of the classroom, Katlyn is highly involved in school organizations. She is the National English Honors Society Artistic Chairman, the National Art Honors Society Public Affairs Officer, and the National Honors Society Secretary. Katlyn is a Student Ambassador for Powhatan and a Student Lunch Group Assistant. She is a member of the Future Business Leaders of America. Katlyn is a PHS Medford League Basketball Assistant, and she is involved in the Leftovers Club and Oasis Club. Katlyn was selected to attend the Capital One Leadership Conference. Additionally Katlyn was a National America Miss Virginia State Finalist. A three sport athlete at Powhatan, Katlyn is a part of the field hockey, basketball and soccer teams. She is a four year member of the Varsity Field Hockey team where she plays as a mid-fielder and has served as a captain. She has been selected for the 1st Team All District and the 2nd Team All Region. Katlyn is also a four year member of the Varsity Soccer team where she plays as a forward and midfielder. She has been named a captain for the team and was chosen as the Offensive Player of the Year. While on the Varsity Basketball team she plays as the shooting guard. Outside of her school athletic career, Katlyn plays for the Richmond Strikers U19 Elite Team. Giving back to her community is an evident piece of Katlyn’s life. As a part of the field hockey team, she has participated in service cleanup at the Blackhawk Gym. With the basketball team Katlyn has volunteered to work on a Christmas Parade Float. Both athletic teams have put on kids camp, where she served as a counselor. She has been involved in her school’s Santa Breakfast and a Christmas Mother volunteer. Katlyn is volunteer for the Special Olympics and the Medford Basketball League. With the Medford Basketball League, Katlyn has assisted with teaching the skills and fundamentals of basketball to special needs students in her school. Additionally Katlyn has given time to assist with school musicals, community trash pick-up, and with Flat Rock Elementary’s field day. Katlyn has won a dinner for two and is now in the running for the $10,000 scholarship. 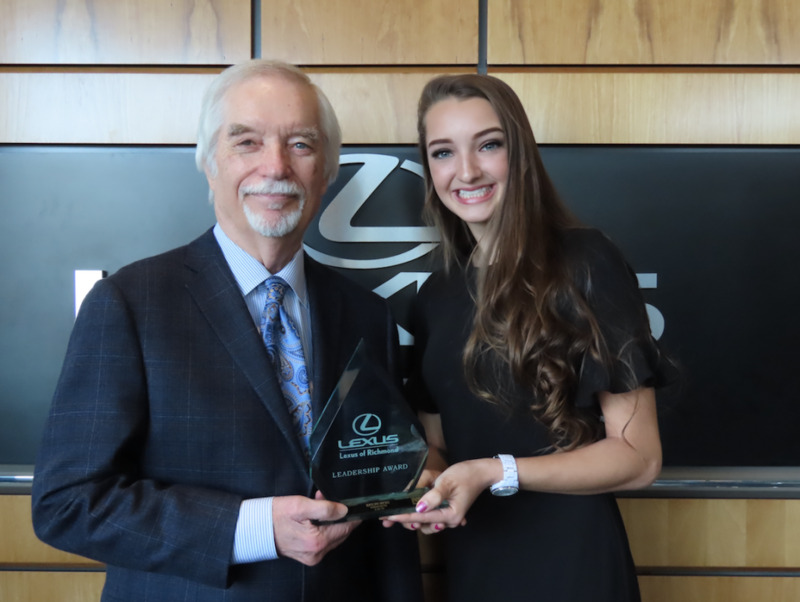 Watch the Fox Richmond – WRLH interview and the Lexus of Richmond Leadership Award interview to learn more about Katlyn! Remember to check Facebook for more information about each weekly nominee throughout the school year! 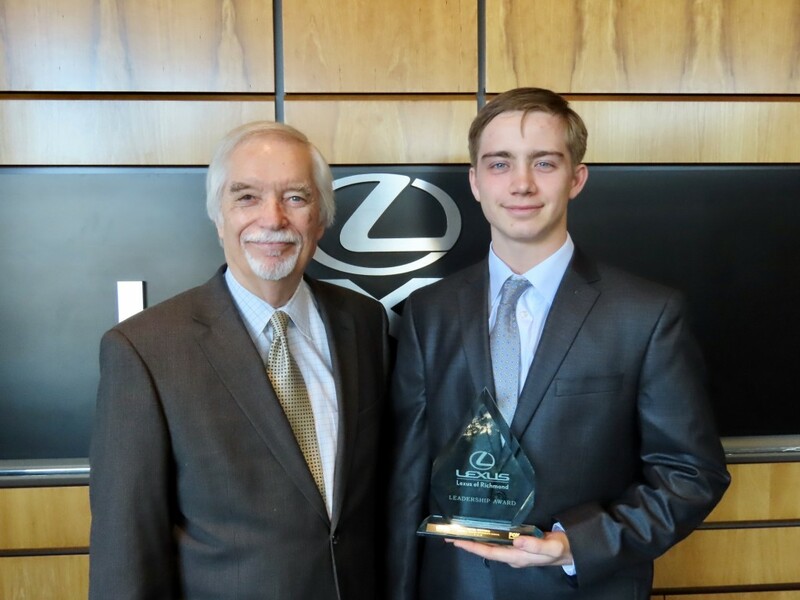 Lexus of Richmond presents David Winters of Maggie L. Walker Governor’s School as our 22nd nominee for the Leadership Award Scholarship. With a current 4.69 GPA David is a member of the National Honor Society, Mu Alpha Theta, and the German Honor Society. He scored a 1560 out of a possible 1600 on the SAT exam with a perfect score on the Math portion. Additionally David scored a perfect 800 on both the Physics SAT II and the Math SAT II. Having earned 6 perfect scores on his AP exams, David is an AP Scholar with Distinction. He is a National Merit Scholarship Commended student, and he has received a Rensselaer Medal for his efforts in math and science. He has coauthored two scientific papers on spintronics. David is a team member for the High School Mathematical Contest in Modeling, and they were finalists in 2018. David is one of four Maggie Walker students to compete at the Society for American Baseball Research Diamond Dollars Case Competition. This involved a research project on the physics and statistics of baseball. In 2018 the team competed and won against college undergrads and graduate teams around the nation. While attending Maggie Walker, David co-founded a club named Kids are Scientist Too (KAST) in 2017. This club was organized to promote science in after school programs around Richmond. David is a two year member of his school’s math club. As a member of the Boy Scouts, David earned the title of Eagle Scout in 2015. With the Scouts he has held various positions of Senior Patrol Leader, Patrol Leader, Scribe and Webmaster. David was a fellow in the VCU School of Engineering Dean’s Early Research Initiative (DERI). Through this program David has completed research on spintronics in magneto elastic nanomagnets. This involves running physics simulations on how defects in the surface of magnets affect their probabilities of changing the direction of the magnetic field when stress is applied. Successful testing on these magnets could one day result in a pacemaker storing data with magnets instead of a battery. As a student of Maggie Walker, David is a member of the Varsity Wrestling team and team captain as a senior. In 2017 he was the 2A Region Runner Up and placed 4th at States. During his junior year, David was the 2A Region Runner Up, and he placed 6th at the State Championship. For his senior season David was named the 2A Region Champion, 145 lbs. He then went on to place 6th at States. David is a member of the Varsity Track and Field team where he competes in shot put, discuss, pole vault and sprints. In 2018 he competed in the State Championship for pole vaulting. Additionally David has practiced Tae Kwon Do for 10 years. To complete his Boy Scout Eagle Project, David organized the construction of a privacy fence for the Girl Scout Pamunkey Ridge Camp. He led a group of 12 fellow scouts and a few adults in order to complete the task. Over the summer of 2018 David assisted the Virginia Department of Environmental Quality to help make their website accessible to individuals with disabilities. He was a volunteer presenter of a bi-weekly educational program called Money Matters. David has given his time to the Hanover Community Support Services. With Hands Up Ministries he helped collect book donations and restock libraries in Richmond. All throughout high school David has assisted New Highland Baptist Church with Rise Against Hunger, Caritas, and Vacation Bible School. David has won a dinner for two and is now in the running for the $10,000 scholarship. 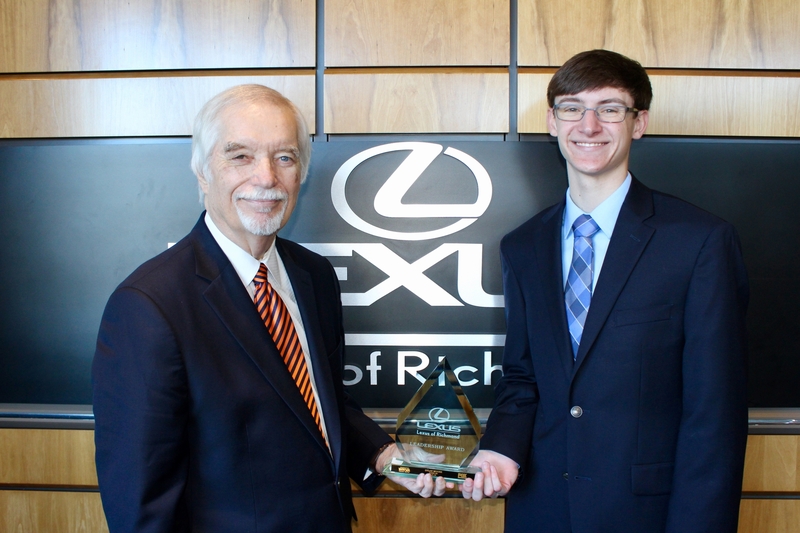 Watch the Fox Richmond – WRLH interview and the Lexus of Richmond Leadership Award interview to learn more about David! Remember to check Facebook for more information about each weekly nominee throughout the school year! 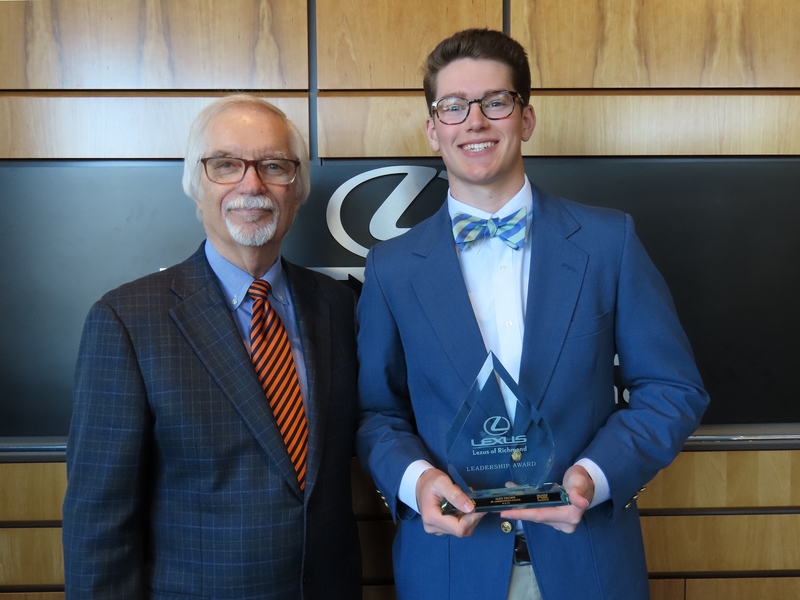 Lexus of Richmond’s 21st weekly nominee for the Leadership Award Scholarship is Dylan Moore of Cosby High School. Ranked in the top 2 of his graduating class, Dylan has a current 4.92 GPA. He is an AP Scholar with Honor having earned 4 perfect scores on his exams, and Dylan received a 1530 out of 1600 on the SAT exam. He is a member of the National Honor Society, Science National Honor Society, Spanish National Honor Society, and Mu Alpha Theta. Cosby High has recognized Dylan with 4 Academic Awards throughout his high school years. In 2016 he was awarded the Chesterfield County Outstanding Performance title for his PSAT results as a sophomore. Dylan was a Junior Marshal for the Cosby Class of 2018. Also in 2018, Dylan received both the Jefferson Book Award and the Woodman of the World American History Award. Outside of the classroom, Dylan is a three year member of Cosby’s National Beta Club. He is a regular member of his church youth group. Dylan attends bi-weekly gatherings at the Church of the Epiphany as a LifeTeen. Heavily involved in Cosby’s Theatre Productions, Dylan has participated in multiple capacities. In 2016 he was part of the stage crew for the Spring Play “Cosby’s 5th Evening of One-Acts”. For the Mid-Winter Showcase, Dylan was an actor in 2018 and the director in 2019. Along with three co-hosts, Dylan runs a podcast where the group analyzes film and cinema. Dylan additionally maintains a YouTube channel with a focus of building Rube Goldberg Machines. In 2016 Dylan received an AutoCAD Certification, and he earned an Inventor Certification in 2017. Over the summer of 2018 Dylan held an internship as technician with Geotech-Environmegtnal Solutions LLC. He received first-hand experience with things such as: field inspections, soil testing, geotechnical drilling projects, field laser survey projects, and engineering project management. A three sport varsity athlete Dylan is part of the Cross County team, Indoor and Outdoor Track teams. Having been on the cross country team since freshman year, Dylan was a captain for his senior season. Spending four seasons on the team, Dylan has received 4 Scholar Athlete Awards. In 2018 he was recognized by the Richmond Times Dispatch for the All-Metro Cross Country 2nd Team. Dylan received the Coach’s Award as a senior. For both his junior and senior seasons, he was named to the 6A Region B All-Region team. In 2017 the team was the Regional Champion and State Runner-Up. In 2018 the team ended the season as the Regional Runner-Up. Dylan joined the outdoor track team as a sophomore, where he is a distance and relay runner. He was awarded a Scholar Athlete Award following his 10th and 11th grade seasons. As a part of the indoor track team, Dylan earned a Coach’s Award for his junior season. For his senior season efforts, he was recognized as the Most Outstanding Distance Runner, and he was chosen for the 6A All Region team. Through the National Honor Society, National Beta Club, and the Science National Honor Society, Dylan has volunteered in numerous community projects. He has assisted with CCPS STEAM Fair, various community 5K’s and with FoxCreek Marlins Swim Team. He has also been involved with the Cosby Athletic Boosters and Woolridge Elementary School. Since 2016 Dylan has volunteered for CARITAS. This has included setting up dining and sleeping accommodations as well as preparing and serving the meals at Church of the Epiphany. Dylan has even worked in the CARITAS warehouse to organize the inventory. Dylan created and organized organized the FoxCreek Haunted House. In 2016, 2017 and 2018 he has worked to build a local community haunted house with the purpose of collecting canned goods to then donate to FeedMore Richmond and Mercy Mall. Dylan is responsible for all aspects of this project including the design, construction, performance and promotion. Dylan has won a dinner for two and is now in the running for the $10,000 scholarship. Watch the Fox Richmond – WRLH interview and the Lexus of Richmond Leadership Award interview to learn more about Dylan! Remember to check Facebook for more information about each weekly nominee throughout the school year! 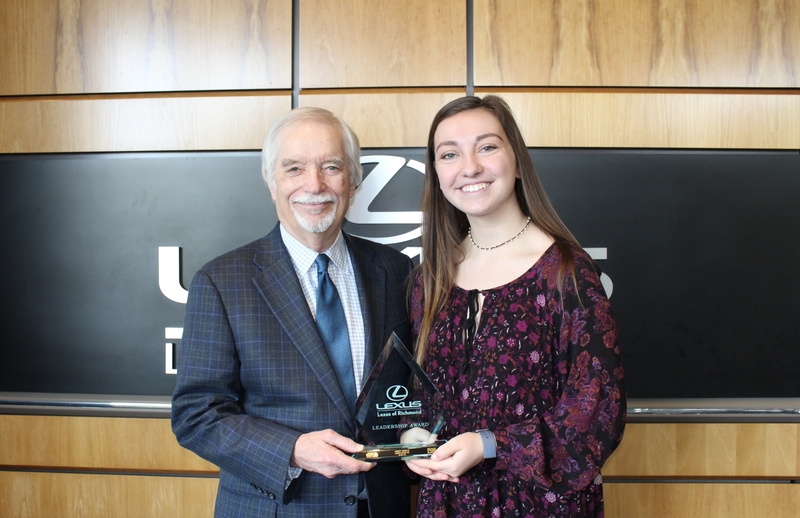 Lexus of Richmond’s 20th nominee for the Leadership Award Scholarship is Abby Rieck of James River High School, Center for Leadership and International Relations. She is ranked 1st in her class of 485 students. With a 5.04 GPA, Abby is consistently on the Distinguished Honor Roll. She is a member of the National Honor Society, World Language Honor Society, Rho Kappa (National Social Studies Honor Society), and Mu Alpa Theta (National Mathematics Honor Society). Abby is an AP Scholar, and she scored a 34 out of 36 on the ACT exam. As a junior, Abby completed the Summer Residential Governor’s School for Humanities program. Throughout high school Abby has been awarded with 12 Outstanding Excellence Awards for her various classes. Last school year Abby was selected as a James River High School Junior Marshal, and she was a recipient of the University of Virginia Jefferson Book Award. Recently Abby was invited to give a TED Talk at the 2019 TEDxYouth RVA Conference where she spoke about Embracing Your Inner Underdog. As a student of the Center for Leadership and International Relations at James River, Abby is working on her Senior Internship to gain experience in her desired career field. She has partnered with Dr. Dean Krusienki in the Biomedical Engineering Department at VCU and with Dr. Patty Smith, the prosthetics coordinator at the VA Hospital. Abby is a two year member of the Spanish Club, and is currently a member of the Beta Club. A four year member of the Student Council Association, Abby is currently serving as a Secretary for the group. She has been involved in her Youth Group at St. Edward the Confessor Catholic Church. Additionally, throughout high school Abby has been a lifeguard at SwimMetro Management Inc. Being a 4 year member of the Varsity Soccer Team at James River, Abby plays as the team goalkeeper. She was named a captain for both her junior and senior seasons. Following her freshman season, she was named the team Most Valuable Player. As a sophomore Abby was selected for the First Team All Conference. Abby was once again named the MVP as a junior, and she was additionally selected the Second Team All Metro and the First Team All Region. On the basketball team, Abby played as a guard. She was the JV captain as a sophomore before moving to varsity for her junior year. Outside of high school, Abby has played for the FC Richmond Travel Soccer team since the 4th grade and was named a team captain as a junior. As a student in the Center for Leadership and International Relations, Abby is working on a Senior Capstone Project. She has organized a 10 week tutoring program at Crestwood Elementary and a children’s book drive. As a member of Mu Alpha Theta, she tutors her peers in any and all math courses. Along with the Beta Club, she has participated in make sales, tutoring programs, and the Christmas Mother. Abby developed and ran a soccer clinic for disabled youth. She has given time to help feed the homeless with both the Daily Planet Breaking Bread program and Caritas. All throughout high school she has been involved with Little Feet Meet, a field-day event for children with disabilities. Abby has won a dinner for two and is now in the running for the $10,000 scholarship. Watch the Fox Richmond – WRLH interview and the Lexus of Richmond Leadership Award interview to learn more about Abby! Remember to check Facebook for more information about each weekly nominee throughout the school year! 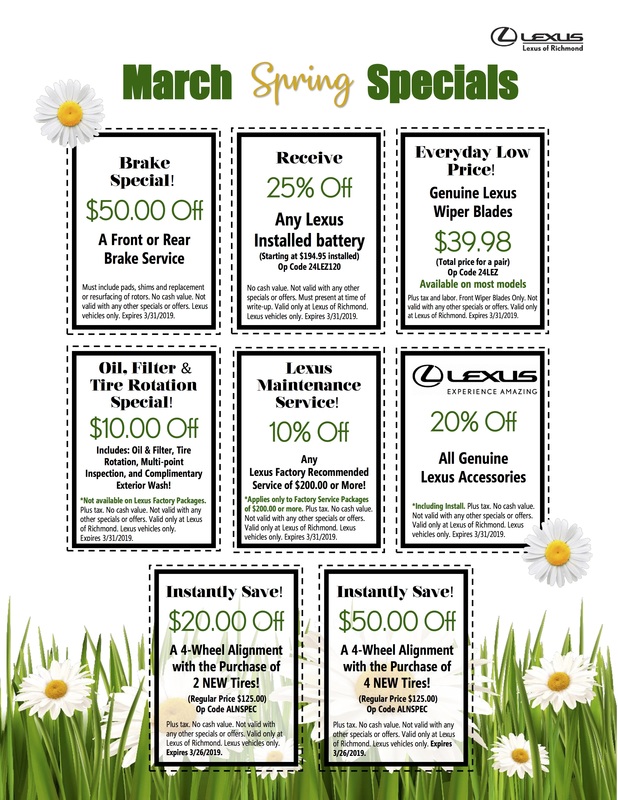 Lexus of Richmond’s March 2019 Service Specials! *These prices are valid through March 31, 2019. 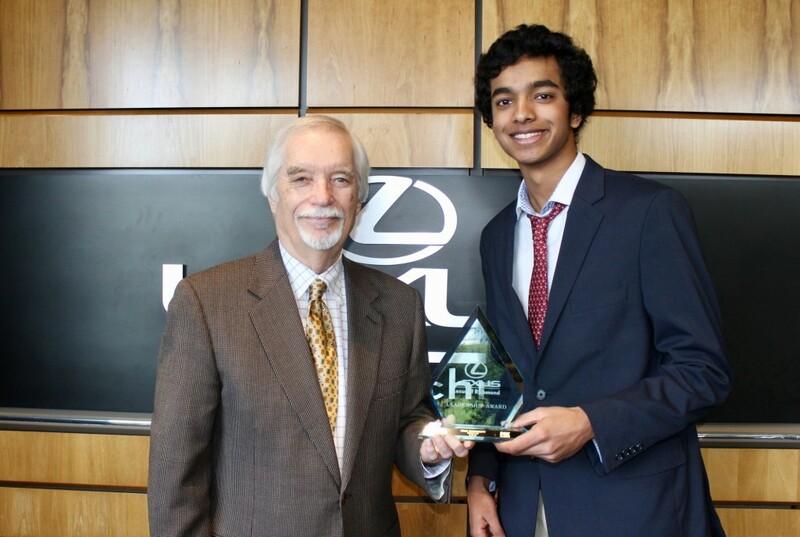 Lexus of Richmond presents Selik Morishetty of Henrico High School as our week 19 nominee for the Leadership Award Scholarship. Having a 4.54 GPA he is ranked 12th in his graduating class of 364 students. He scored a 34 out of a possible 36 on the ACT exam and a 790 out of 800 on the Math SAT II. He is a member of the National Honor Society and a part of the Student Council for the Science National Honor Society. As a member of the Virginia Junior Academy of Science, Selik was the Editor in Chief as a junior; he is currently their Communications Liaison. For his research project on “Alginate Hydrogel Beads for Controlled Drug Delivery Applications”, Selik won: 1st Place at the Metro Richmond Stem Fair, Honorable Mention at the Virginia State Science Engineering Fair, ISEF Nominee, Grand Winner Chemistry Division, and the Special Award from the American Chemical Association. For a research project in 9th grade on “The Effect of Curcumin on E. coli and Probiotics”, Selik received an Honorable Mention for VJAS and 3rd Place for the Metro Richmond STEM Fair. In 2018 Selik completed a 4 week course with the Summer Residential Governor’s School for Medicine and Health Sciences. Selik has participated in Pfizer Pharmaceutical Research where he utilized molecular biological research techniques to investigate natural properties of curcumin on bacteria and probiotics. By participating in Virginia Commonwealth University Undergraduate Research, Selik studied the physical attributes of a natural polymer, Alginate. He created an efficient vessel system of Alginate hydrogel beads to deliver an administered drug. Selik has also shadowed doctors at the VCU Medical Center. He is a member of the Model United Nations, and he was selected as the Best Delegate at Old Dominion University. Selik is a member of the Math Club, Chess Club, and the Red Cross Club at Henrico High School. He is the Beth Shalom Head Volunteer. Through the Hindu Center of Virginia, Selik is a performer and teacher of classical music. As a four year member of the Varsity Tennis team at Henrico, Selik was a co-captain for his junior season. Following sophomore year he was selected for the team MVP. As a freshman Selik was a nationally ranked player for the United States Tennis Association (USTA) in the Mid-Atlantic Region, and he has played on the USTA Junior Tennis Team for the region. Selik has additionally played for Henrico’s Varsity Volleyball team. Present and active in his community, Selik is no stranger to giving his time and assistance to various organizations. He has been a Sports Backer Race Volunteer. Selik has given time to the McGuire Veteran Affairs Hospital by assisting in the Short Term Rehab Facility. He has participated in making fleece blankets for the VCU Children’s Hospital. He has been involved in Anthem BlueCross BlueShield Pediatric Cancer Fundraising. Through the Hindu Center of Virginia Selik has helped with Rise for Hunger; he helped package and deliver food to underprivileged families. Selik has also been on a mission trip to India. His tasks ranged from spending time with the children (singing, reading, teaching etc.) to building a toilet in order to help the local sanitation and irrigation. Selik has won a dinner for two and is now in the running for the $10,000 scholarship. Watch the Fox Richmond – WRLH interview and the Lexus of Richmond Leadership Award interview to learn more about Selik! Remember to check Facebook for more information about each weekly nominee throughout the school year!